My fascination with aviation began at age three when, seated atop my father’s shoulders, I watched, enthralled, as the F-4 Blue Angel #4 pancaked with a rooster tail of fire sliding across the runway at an airshow in Iowa. It was my first memory and sparked a flame of enthusiasm and wonder that has grown brighter over the years. As a child, with that enthusiasm, my father and I would quietly build models of all sorts of aircraft in his basement workshop (a few of which after ample play- with or without his blessings- still exist today). 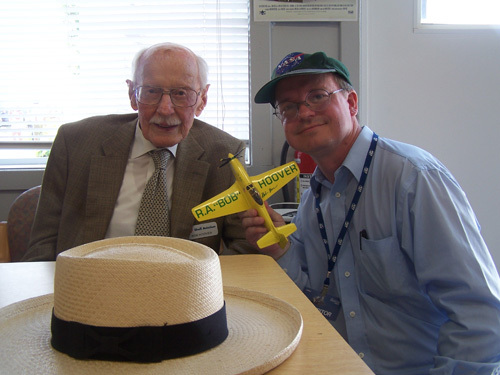 Little did I know that someday they would become the progenitors of what has become the world’s largest collection of handcrafted aviation and aerospace models signed by historic figures of aviation beginning with World War I through the 21st century. As a young adult, I left the “nest” and moved to Chicago where I established the most prolific living history museum in the city. While I may have flown the coop and left home, I took the passion for flight with me and began visiting the legendary figures that charted the course of aviation history and have them sign models of the very aircraft in which they chartered that course. Regrettably, in a harsh lesson in the ugliness of corporate greed, I was a victim of a hostile takeover and the museum closed after four short, but glorious, years. In that time, my father had not had a chance to come to the city and see the great cultural institution it had become. The collection, and the legacy of history it represented, went to the hangar and remained stored there as I embarked on a career as a journalist and tour guide in Washington D.C.
At the same time, my father, who had since been diagnosed with cancer, was worsening. Interestingly, it was he who, again, like he had on the tarmac at the airport in Iowa three decades before, ignited the spark once more, prompting me to become all the more determined to expand the collection so that he might see it before his final flight into the sky. To start again, I decided that I should add a model of the #4 Phantom that had ignited this passion, and have it signed by the aviator who flew it that fateful day so long ago over the cornfields of the Hawkeye State. To my great surprise, not only did I identify him, but I discovered that he lived less than forty-five miles away from my residence in Maryland. The model was perhaps the most beautiful in my collection, but, alas, I was unable to complete it with the signature in time. I came back to Iowa to care for my father, and less than two months later, he was gone. He never saw the model nor the collection which it would join. I vowed than that I would further the collection and make it the greatest of its kind in existence. I stands today at nearly four hundred models and a menagerie of nearly as many works of art by the most accomplished of aviation artists in modern history. I think my father would be proud and glad that this collection so ably upholds our nation’s aeronautical heritage, and that through these models and fine works of art, the passion and appreciation for the pilots, aviators, executives, engineers, technicians, laborers, and crews, shall be preserved for generations to come. It is with infinite pride, I present, The Wendell Air and Space Museum online.